The phylum Gastrotricha includes about 750 species of meiobenthic marine and freshwater species that are often widely distributed. The microscopic size, short life cycle, low motility of adults, and the absence of larval stages normally required for dispersal raise doubts about the putative cosmopolitan distribution of many of gastrotrich species. The phenomenon of cosmopolitanism is acknowledged for all major meiobenthic taxa (“the meiofauna paradox”) and can be explained, at least in part, with the existence of sibling species, so far identified primarily by molecular analysis. In this paper, we report the discovery of sibling species in the marine chaetonotidan Xenotrichula intermedia using confocal laser scanning microscopy (CLSM). A total of 40 specimens collected from two geographically separate populations, the Mediterranean (Adriatic Sea) and the Arabian Gulf (Kuwait), were investigated. Fifteen specimens of each population were studied in vivo with a contrast interference microscope (DIC) in order to obtain the main morphometric parameters; ten other animals (five in each population) were fixed and marked with fluorescent phalloidin for the observation of their muscular systems under CLSM. The metrics and meristic data of the two populations fall within the range of measures recognized for the species. 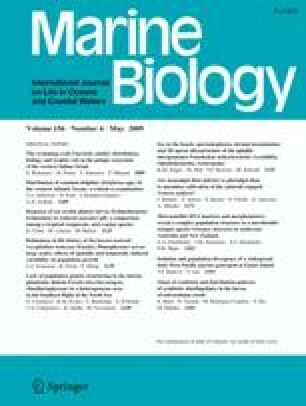 Pairwise comparisons (t-test) in general did not reveal statistically significant differences between the traits of specimens belonging to the two populations; moreover, multivariate analyses (cluster- and MDS analysis) were unable to separate clearly the Mediterranean from the Arabian specimens. In contrast, an examination of their muscular systems revealed clear dissimilarities between the two geographic groups. In particular, while the Italian specimens possessed incomplete circular bands and dorsoventrally orientated muscles that are partially inserted into the basal lamina of the cuticle, in both splanchnic- and somatic positions, their Arabian counterparts showed partial dorsoventral bands and complete circular muscles that surround the entire body of the animal in the same corresponding positions. Additional differences in the position of helicoidal bands (present in a more anterior location in the Italian specimens) are noted between Mediterranean and Arabian specimens. Since the investigated animals share a similar interstitial habitat, a working hypothesis connects the differences in the musculature to possible differences in the reproductive modality of specimens between the two populations. The research benefited from a MIUR grant to MAT (PRIN-2007—Approccio integrato all’identificazione dei Gastrotrichi marini). Both the confocal laser scanning Leica DM IRE2 and the Eclipse 90i Nikon microscopes have been funded by the foundation CaRiMo. We are grateful to three anonymous reviewers for their insightful comments on an early draft of the manuscript.